I've got a lot of items in my household. Just on my nightstand alone, I have my phone, my work phone, my smartwatch, my wife's phone, and then maybe a portable battery or 2. Finding good charging stations is hard. Well, here's a device passed on to me that kinda fits that problem AND throws in a speaker for good measure. Okay, so first up, it is meant as a charging stand/docking station. For that there's 3 'docks' on it for you to put your devices. There's a large one at the 'back', and 2 in the front. The large is meant for tablet, or I like to use it putting my phone in landscape mode. The 2 smaller ones in front aren't as friendly for 5.5+" phones, but it does the trick in portrait mode (tho' you could put one in landscape). Now you have place for your devices to 'sit' when not in use, so they're not just laying on the nightstand or coffee table flat. They're easy to see. 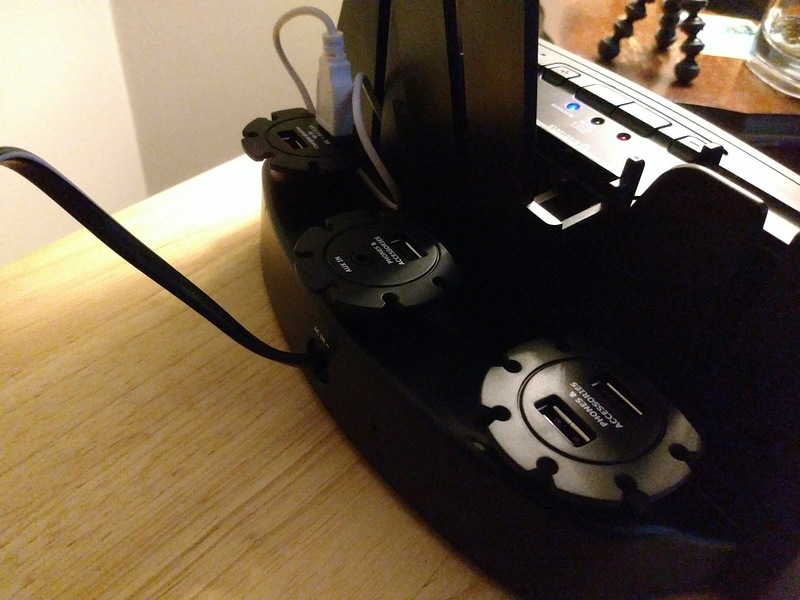 'Round back of the device we see 5 USB ports for you to plug in your cables for charging. 2 of them are at 2.1A, the others are just at 1A. So keep that in mind. 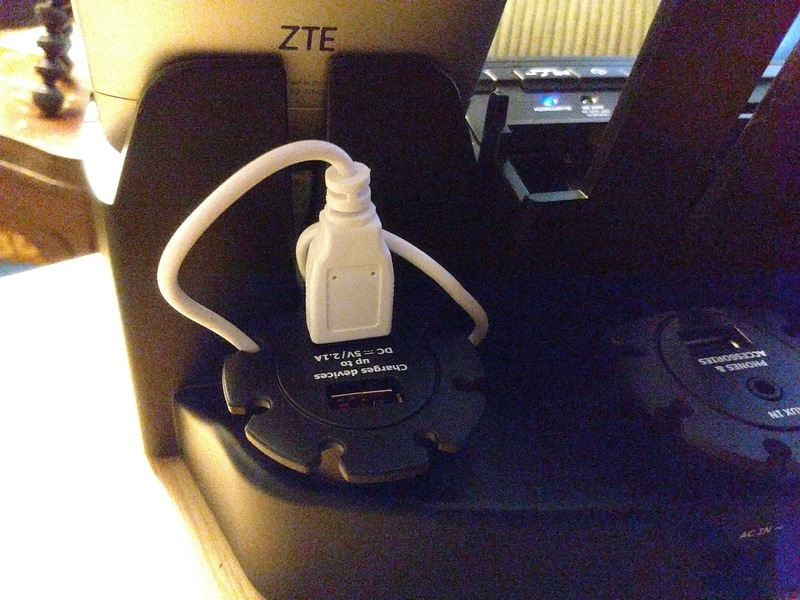 You're given a few short cables (2x microUSB, 3x 30pin iPhone, if you have lightning or USB-C, you'll have to provide your own) if you so want to use theirs. 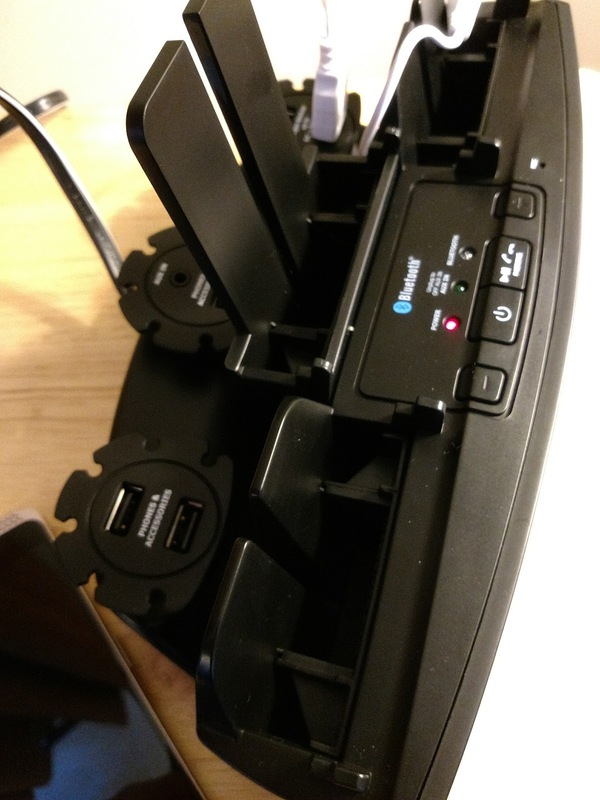 The gist is to plug the cable in, snap it into one of the little clips and then wrap it around the hub and then put the charging end into one of the dock stands facing up (hence they have a slit down the back). That'll leave the device end of the cable facing up, however you'll still need to fish in there a bit to make sure it goes in to the device and then let the device rest in the dock slot. In the end it makes a nice 'cozy' for them all to hang out in one place. 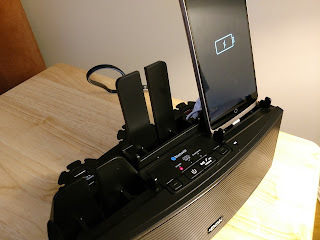 I could put both of my phones in there to charge over night (I'll need to supply my own cables as my phone is a USB-C Moto Z and my work phone is a lightning plug iPhone 6S) and still have a cable off to the side to plug in my Moto 360 Sport charger. It takes up more real estate on my nightstand, but it also is an organizer and stands them up for easy viewing. The main reason for the extra space of the device comes from the big speaker in front, as it'll act like a bluetooth speaker. Pairing is dead simple, the buttons there are all easy to understand (THEY EVEN HAVE SEPARATE POWER BUTTONS!! KALOO KALAY!). 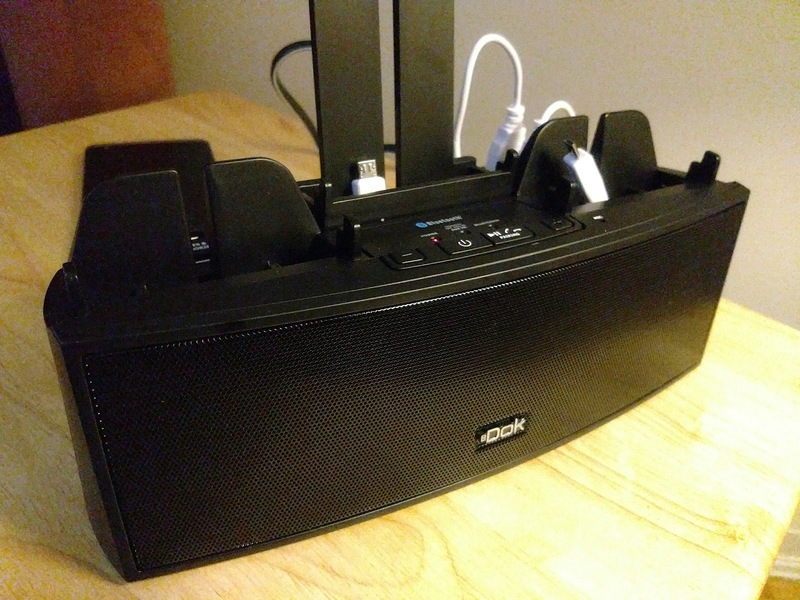 The speaker can even act as a speakerphone for you as it has the mic in front. So, it sounds okay to me, but quieter than I'd expect. I asked her what she thought. Previously she had been using the Mpow Aqua Pro and hung it from some shelf. She prefers the sound from the Mpow (whether she said it's just louder or because she had it placed higher, she's not sure), but the sound quality is better there, but she does prefer being able to have a stand for her device on the counter. In the kitchen it's not so obtrusive there, so it's staying. In the end, it does feel a little 2013, a little clunky, but does the job. Would it be worth the $100CAD? Well, not in my view unfortunately, but to some it might. Personally, I hear there's a newer version coming out and I can't wait to try it out.